A malfunctioning garage door is a significant inconvenience. Such entries are operated by rollers which help the door to open and close. Sometimes it might be possible that your garage door comes off track and you have to put it back on track as soon as possible. For that, first of all, you have to calm down and practice some patience. Professionals suggest that if there is a situation like this, then we should stop operate it immediately. If we don’t stop, then the door can sustain severe damage. All the moving or lose parts of a garage door must be aligned for it to work correctly. 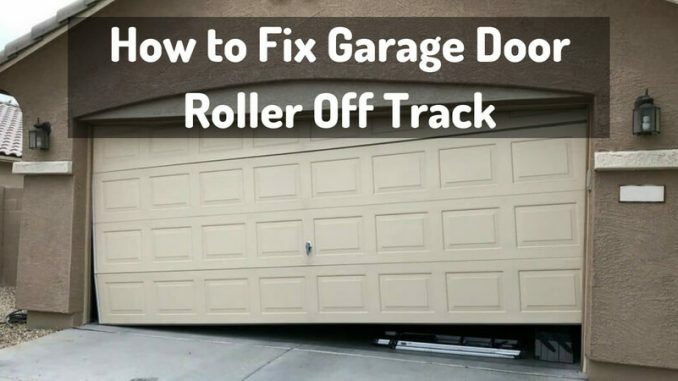 If you can catch the detached garage door, then you can put the rollers back onto the track without taking any help. Or, you can call garage door technician to straighten or replace the door panels to avoid further damage. But if the process does not involve the dorr’s tension spring, it is a project you can do all by yourself. Let’s find out what we can do about the off-track garage door. How to Fix Garage Door Roller off Track? There are a plethora of ways you can use to get the rollers on track. It is essential to find the main issue, the reason for it before you try to fix the door so that you can avoid such accidents in the future. The very first step is to separate the garage door opener from the door. For that, you need to find the handle or the rope which is dangling from the center of the door opener track. Place a camp onto the track about 0.50% of the way up the door opening. To detach the opener, hold the release rope and pull the handle. It is essential to keep the rollers of the door aligned with the track. Raise the door slightly so that the rollers can connect with the problematic portion. Use pliers near the top of the track and bend it slightly open. Secure the door by clamping a pair of locking pliers on the track at the bottom of the door. Now, line up the first roller with the opening. Here you can use the screwdriver and wedge so that you can put the rollers again on track. Pry the roller out of the track and make sure to remove the old rollers. Then, attach a new roller into the track. Now, open the garage door track from the other side. That track might be full already to help the wheels of the rollers back onto the track. Change the door setting and keep it down to the next roller and follow all the steps you did before to line up the first roller. After replacing both the rollers, now it’s the time to remove the locking pliers and lower the door. Check the remote control and match the frequency. As the opener goes through its maneuvers, it will catch the door. Check the door several times to ensure the door is working correctly. You can also take help from your friend to be safer. It might be possible that the door slips from the track and hurt you a bit. So, always keep a helper on the spot. If you see places where the rollers are not stable, straighten the track one more time. If rollers are appropriate and you need to adjust the tracks, then loosen the bolts on the side and re-align the road. Then tighten the bolts. Each screw and bolts must be tight because the vibration of the opening and closing door can loosen it over time. So, these are few steps to fix the garage door off track. There is just one thing to keep in mind is that you must not forget to unplug the garage door opener from the outlet and always keep a helper with you to avoid any unwanted accidents. Though this guide can help you to fix garage door roller off track, you should never do it if you are not comfortable doing it. Once you get habituated with the procedure, you can use garage door roller guide and repair them quickly.